These are the questions I get asked most of the time, but please if your question is still not answered. When is the best time to schedule my newborn session? It’s always best to try and book your session while you are still pregnant. I only take a limited number of sessions per month and if you leave it until baby is born sometimes I wont be able to accomodate you. What is the ideal age to photograph a newborn? The ideal age for me as a photographer is within the first 2 weeks. If you are breastfeeding often your milk wont come in until day 3 or 4 so its important to wait until after that and once you both have the hang of feeding. When you have your session your baby will need to be nice and full to be content for the whole session. I’m always willing to work with babies outside this window. Your newborn is a newborn until they are three months old. But once you pass the two week window it may be harder or even impossible to get those sleepy shots you see on my page, but we will try our hardest and still get some lovely images of your baby. 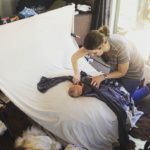 Where do you do your newborn sessions? I travel to your home and set up everything required for a newborn session in your home. I do work with natural light and require a large window or ranch slider something that is lower to the ground. If your home is particularly dark we can discuss other options. Is there anything I need to provide for the session? You may need to feed a few times during our session, so having bottles at the ready is helpful. I highly recommend bringing a dummy/pacifier even if you aren’t planning to use one regularly. It can help me with soothing baby when transitioning between poses. Props – i have a gorgeous selection of props, wraps and accessories for your session. however if there is something sentimental you would like to incorporate e.g. Nanas blanket, family heirloom etc please let me know. I do a thorough editing of every image in your gallery. I will go through and clean up their little faces of dry skin, scratches, baby acne, etc. Anything else i tend to leave. Newborn photography is all about capturing them just as they are in that moment. If you would like extra editing this can be discussed. Do you photograph parents and siblings in the session? Older siblings – this can be a fun ride but I have huge amounts of patience to get your little ones together for a photo. Siblings and parents are not required to be present for the whole session. What do we wear for photographs with our baby? Less is more, skin is gorgeous in images. Colour wise please stick with neutral or soft tones or simply black or white. Stay away from patterns and logos on tops. Mums – Have a think about getting your hair and makeup done, you can view some of the hair and makeup artists that I recommend . Otherwise hair down and soft around your face and an emphasis on your eyes when doing your own. What actually happens at a newborn session? I will send you detailed information on how to prepare for your session. But basically once we have baby asleep you can relax, read a book, take a nap or just watch your gorgeous new baby be photographed. I have loads of experience handling babies so you really can sit back and relax until you need to feed them. Why aren’t images included in my session fee? The session itself is a huge time investment for me. Between corresponding with you, planning your session, travel to your home, setting up in your home, the session itself (normally three hours), packing up, driving home and then the clean up of props. I have typically spent around 6 – 8 hours of work before i even upload the images to my computer. I absolutely love what I do, but I am unable to offer my time for a minimal cost and still run a successful business, while supporting my family. When and how do I view my images? After your session, usually within two weeks you will come to my home in Hastings for your viewing and ordering session. Here you will see a gorgeous slideshow of your images. You will be able to view and hold the fine art products I offer, these complement my style and give your images the best results possible. At this stage you can choose the package you would like to purchase and the images you want for each product. 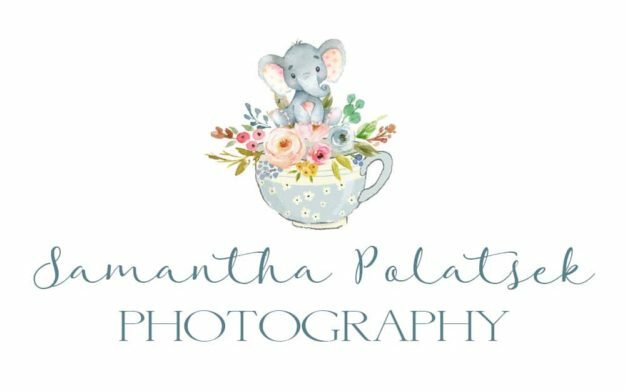 Samantha Polatsek Photography offers sessions and packages as a very special gift for loved ones. I do recommend you speak to your loved ones first or encourage them to have a pre-consultation with me first so they are aware of the extra costs involved, the products i offer and how my sessions are carried out. Any gifts purchased are non-transferable for cash, however at the discretion of the photographer may be re-gifted or the session can be rescheduled if a date can be agreed upon. Special gift voucher pricing is offered so please get in touch to chat more about how we can create beautiful memories for you loved ones. My friend has a really nice camera and has offered to do my newborn photos for free. Newborn photography is in no way, shape or form easy. I have spent hours doing classes in posing, safety, lighting techniques and how to use props, to enable me to create beautiful images of your baby. You only need to look at “baby photography fails” and you will see. All i can say is don’t do it, you will be disappointed. I have lost count the amount of times i have heard Mums saying they wish they had booked a professional. In this industry, you truly do get what you pay for.